Ask any personal trainer what the best body weight exercise is, and you’ll get a response. Probably a different response than the next personal trainer you ask. Keep asking around, and you’ll get a long list of “best” body weight exercises. Put them together, and you will have a compilation of pretty good exercises with no equipment required! But something will be missing when you separate the parts from the whole. The criteria must be broadened. You may have gotten pretty good answers, but you were asking the wrong question. A person cannot just do one exercise and expect a total body metamorphosis. That type of thinking would be tantamount to thinking you could just switch your Coca-Cola for mineral water and turn into a lean mean machine. To change your body size, you have to make many conscientious changes your diet. To change your body shape, you have to commit to a compound series of excellent exercises. Put those superb exercises together, and you have a great workout. Do that regularly, and you have a program. Programs change physiques, not isolated exercises. With expanding the scope, you make it possible for a trainer to give you a series of exercises to target quads, glutes, hamstrings, core, pecs, lats, deltoids, triceps, and biceps; develop muscular endurance and strength; cardiovascular endurance; flexibility; and change body composition. That’s way more appealing that any progress you could have realized from one isolated exercise. Let’s go back to the nutrition story. Changing from Coke to mineral water would be a small change. Changing your donut and coffee breakfast to steel cut oats and kale juice may be a bigger change. The biggest change may be switching every nutritionally sparse meal to a nutritionally dense meal (and doing that day after day, week after week). You’ll achieve great results from that. But if what you seek is the more than great- if you want to achieve the ultimate success, you’ll go even a step further and hire a licensed dietitian. If you were to perform the Top 5 Body Weight Exercises with my recommended prescription of 1-minute of each exercise with 10, 20, 30, 40, and 50-second rest periods between each, respectively, and repeat that circuit twice (3x total), you would have a great workout. Do it regularly, and you’d have a great program. But if the apple of your eye is the ultimate workout, you should go one step further: add a weighted vest! The Hyper Vest Pro by Hyperwear is the best weighted vest on the market. It is a compression vest that hugs snug to the body. The patented design allows the material of the vest to stretch horizontally to stretch with you as your diaphragm contracts and your chest expands (when you start breathing like a beast!). However, it won’t stretch vertically or shift up and down while you’re in motion. Most weighted vests are cumbersome — they’re intended to make your workout better, but they end up just getting in your way. With the Hyper Vest Pro, tiny steel plates are positioned throughout the vest (front and back) protrude half an inch from your body. 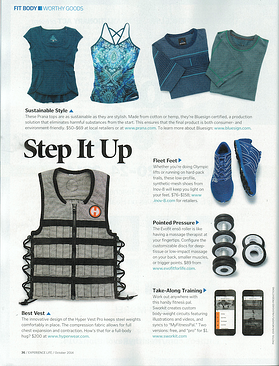 This way the vest adds challenge to your body weight workouts without constricting movement! I have created this video to demonstrate, teach, then join you for the Top 5 Weighted Vest Body Weight Exercises. I’ll take you through the exhilarating circuit that we build with the exercises one time. On your own, run through that circuit twice more. With the Hyper Vest Pro, you will surely agree: this is the ultimate functional workout!